This book offers a detailed review of the remarkable advances that have been made in research on the pathogenesis of a number of neuroimmunological diseases, as well as outlining novel treatments including the use of monoclonal antibodies. 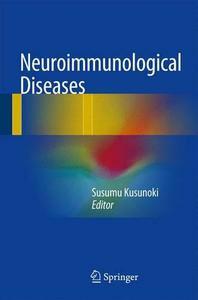 Written by renowned experts who have made major contributions in the field, such as identifying neuromyelitis optica as an immunopathological clinical condition, identifying the role of ganglioside and ganglioside-complex antibodies in Guillain-Barré syndrome, and developing a novel treatment for POEMS (polyneuropathy, organomegaly, endocrinopathy, M-protein, and skin changes) syndrome, the book summarizes recent advances in basic and clinical research. Neuroimmunological Diseases is a useful resource for not only researchers but also neurologists who are engaged in the management of neuroimmunological diseases.